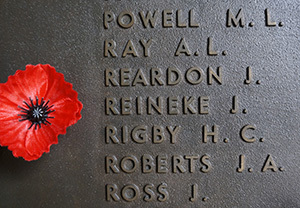 Residence before enlistment SA, NSW, Victoria, Brook Hill, Green Vale via Broadmeadows, Vic. Over 20 Russians took part in the famous raid on Beersheba on 31 October 1917. Among the casualties in the raid was John Reineke from Libava, a man described as being 'very strong', and most probably of German descent. 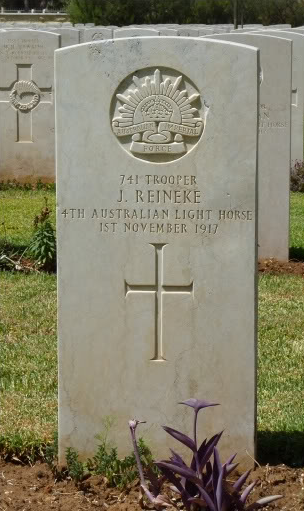 Reineke had worked as a labourer at Greenvale, north of Melbourne, and was among the first Russians to enlist in the AIF; he was with the Light Horse Regiment in Gallipoli. Corporal Smith described what happened to Reineke in the Beersheba raid, 'I was in the same charge myself on the 31st October 1917. He was with the first line charging into Beersheba and was hit in the stomach with a bullet whilst charging.' In the evening he died at a field ambulance station. His comrade Lance-Corporal Tomkins added, 'He was a fine chap in the Unit and remarked as he was dying "It is jolly hard to die like this after having gone through so much of the War".' A few days after that another man from the Baltic Provinces, Franc Matzonas, probably a Lithuanian, was killed in the raid at Tel el Khuweilfe. Reineke and Matzonas are both buried at the Beersheba War Cemetery.